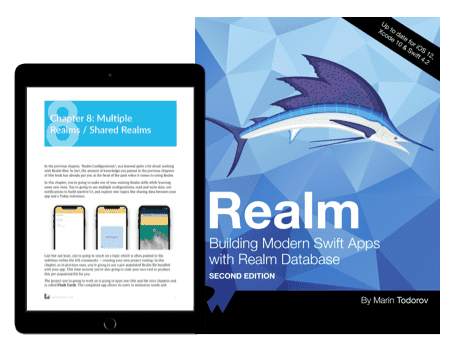 Create powerful, reactive iOS apps with Realm Database and Realm Cloud! Realm finds the sweet spot between the simplicity of storing data as JSON on disk and using heavy, slow ORMs like Core Data or similar that are built on top of SQLite. The Realm Database aims to be fast, performant and provide the commodities that mobile developers need such as working with objects, type-safety, and native notifications. Realm Database has been under active development for several years. It powers apps by some of the biggest names in the App Store, including Adidas, Amazon, Nike, Starbucks, BBC, GoPro, Virgin, Cisco, Groupon, and many more who have chosen to develop their mobile apps with Realm. Realm Platform is a relatively new commercial product which allows developers to automatically synchronize data not only across Apple devices but also between any combination of Android, iPhone, Windows, or macOS apps. Realm Platform allows you to run the server software on your own infrastructure and keep your data in-house which more often suits large enterprises. Alternatively you can use Realm Cloud which runs a Platform for you and you start syncing data very quickly and only pay for what you use. In this book, you’ll take a deep dive into the Realm Database, learn how to set up your first Realm database, see how to persist and read data, find out how to perform migrations and more. In the last chapter of this book, you’ll take a look at the synchronization features of Realm Cloud to perform real-time sync of your data across all devices.